Prices starting at $699 for a 7 night cruise on this 5 star cruise line. There are some really great last minute deals out there right now. Click on this link to see our latest email offer that was just released. Here is an article from Cruise Radio that we thought would be really helpful and we decided to share. This fall I’m going to be traveling an estimated 17,000 air miles. That’s a lot of airports, and flying out of Jacksonville, that’s a lot of layovers. There are a few things I pack to keep myself organize and entertained sane during an airport layover. Gate Guru app. I won’t talk about an app unless I use it, and thanks to a US Air captain I’m hooked. I am a big fan of Gate Guru. The folks at Trip Advisor developed it and it shows you what there is to eat (most importantly), local weather, a map of the airport, tips from other passengers, amenities, flights that are scheduled out of that airport and gate information. Pretty much it’s everything you need when you get to your destination in one little handy program. It’s truly brilliant. Check out Gate Guru here. Power cord. You will be a hero when you roll into an airport (like Philly) with a power cord. They have just a few plugs in the main terminal areas. If someone is using one of the plugs, ask if you can plug your power strip in and invite them to use your power strip. Crisis averted. Back up battery. You can get something that will cost you around $75 like an Mophie or a rechargeable unit from your local drug store or off Amazon. I use a power pack from Duracell that charges off my USB drive. It is good for a little over one charge and I charge it overnight after every use. Notebook. I’m not talking about the Nichols Sparks novel, I’m referring to an actual little notebook. They come in handy for the folks whose mind that never shuts off (like mine) or for a to-do list when you get to your destination. Plus, as of now, we can’t use electronics — on take off, taxi or landing — so it gives you something to do if you don’t want to make mindless conversation with the stranger sitting next to you. Gift Card. I always do my research when I am heading to an airport with a layover and pick up a gift card for a places that I will want to eat or get a coffee from. It helps because it makes me not want to buy a bunch of fatty airport food and keeps my budget under control. I keep the gift card in my backpack and don’t have to reach for my wallet. I get very paranoid when I pull my wallet out in airports. Not because of crime but because I’m clumsy and have dropped debit cards before. These are just a few things I use in my arsenal of airport survival tools. 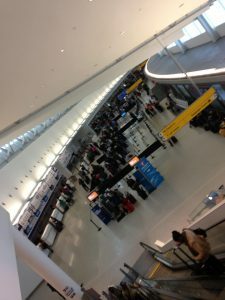 What do you use when to help with layovers? The Cruise Experts is hosting a travel show on Friday October 18th. Call to R.S.V.P. if you can attend. See link below to get all the details. While the world is filled with incredibly beautiful places and an entire lifetime would not be enough to see and feel them all, there are some destinations on Earth that should be seen before everything else. Greece is one of these places, where the magical nature meets the legendary history and where one could discover more about himself than about its surroundings. The Greek Islands are truly enchanting and people have been travelingthere ever since travel was invented, seeing amazing ancient cities and charming traditional Greek villages, with their unique white dwellings hanging over the azure blue seas. Among these unforgettable islands, one has become the most vibrant and a favorite destination for people looking for entertainment and fun. From the thousands visitors traveling to Mykonos, many of them come by the sea, onboard massive cruise ships that stop to see the island. Unknown to many, this small Cycladic Island is much more than a party destination, with picturesque small fishing villages with white houses and small bays, with beautiful windmills and churches set around the charming Aegean coast. Nevertheless, most people arriving in Mikonos by cruise ships should definitely try the colorful and liberal nightlife on the island, with countless pubs, bars and discos, most of them open all night and featuring amazing atmosphere. Mikonos is also recognized as being an gay-friendly destination, with special locations just for the community. The other major attractions of Mikonos are definitely the beaches and the sea, with amazing destinations to relax and feel the unique vibe of the Greek islands. Although shadowed by the nightlife and the beaches, Mikonos also offers some amazing and interesting landmarks for cruise passengers. The capital of Mikonos Town or Chora features exceptional attractions, starting with the famous white windmills overlooking the sea and offering amazing sunset views, the Little Venice quarter, the Panagia Paraportiani church and the famous Petros pelican. Still in the town, one could also visit the interesting museums, including the Maritime Museum, Archaeological Museum, Folklore Museum and others. Other smaller charming traditional settlements include Ano Mera, Agios Ioannis, Platis Gialos and others. 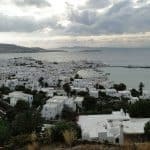 A visit to Mikonos while your cruise ships stops here should also include a visit to a delicious local restaurant, some exciting shopping for local produce, trying the diving and snorkeling opportunities and many others.